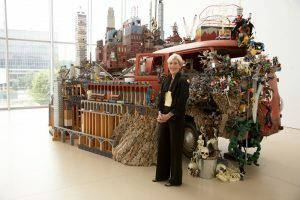 Gathered in the exhibition space as in a great carnival or flea market, vehicles, models of vehicles, dwellings and model dwellings compete for epistemic authority. The gallery is filled, detail upon detail, in a satirical exploration of a culture’s excessive production. Most of the works in this show are comprised of the kind of equipment used to keep in abeyance our fear of emptiness, either in terms of space or time: the tools and materials of recreational pursuits like gardening, renovating or camping. Curator Sandra Grant Marchand has organized a glimpse of Toronto artist Kim Adams’ prodigious output in his first large-scale exhibition in Montreal. Adams resists transforming the gallery into a sculptural place of formal perceptual tension, but relies instead on space socially ordered by the ambiguous status of objects and activities relative to their designation as art. The exhibition space becomes a container “stocked” with sculptures and models. This aspect of the exhibition is consistent with Adams’ assemblage work in general: sculpture from components already assembly oriented like sports equipment, vehicles, toy model kits and household gadgets. The kit is one of the basic modes of postmodern fabrication and this is one of the organizing themes of Adams’ work. Our urban environment, like the kit, is assembled by a series of components that, in themselves, compose a loose network that can be modified according to the will of planners. This environment provides many of Adams’ materials. The wheel is everywhere is this exhibition. So are ersatz homes, assembly line housing, especially of the mobile variety. Also, non-mobile implements have sometimes been given mobility through the addition of wheels. In Model: Decoy Homes (1987), for example, a standard metal ironing board has become an oversize skateboard with the addition of four wheels, one at each corner. This work is either a sculpture with no base or a sculpture comprised only of bases standing one on another. The extended legs of the ironing board serve as a base as does the board itself for other elements stacked above in tiers. First, three kitchen garbage cans are housed in a construction which functions to support a second tier. Two hardware cabinets balance on this upper level and they too have wheels which rest on tracks allowing the cabinets to shuttle back and forth, but only a short distance. Both cabinets have chimneys composed of actual ducting and one has a standard galvanized metal outdoor garbage can stuck on its roof. The ensemble is precarious, and it is this aspect combined with the futility of wheels spinning in space, of vehicle/homes which track back and forth a few useless inches, that reveals a sense of ambiguous humour, bleak but compassionate for the unavoidable frailty of the “constructions” with which we comfort ourselves. Organized along the lines of the figurative structure of linguistic operations, Adams’ works reflect on the rhetorical relations pertaining within language. For example, in He/He (1990) two tricycles are siamesed, sharing a common rear axle and driving away from each other. This vehicle is coming when it is going and vice versa, or transposed into the form of language it is an unsaying in the act of saying. He also draws humourously strained analogies: abstract themes such as the circularity of language as model/model as language manifested concretely in works featuring uselessly spinning wheels. Duchamp’s Bicycle Wheel (1913) substituted contemplation for action, for history, and this suspension of the wheel’s function and the foregrounding of the sculptural base is clearly a motif for many of Adams’ works. Earth Wagons (1989-91) is comprised of a miniature mountain resting on an assembly of a child’s wagon and two utility trailers such as are pulled behind the family car for work on the house or garden. The two trailers are supported, wheels off the ground, by jack stands which ambiguously mediate or “stand between” the institution and the art. Vehicles ride piggyback on other vehicles, a model train pulls a chain of flatcars conveying recreational vehicles, while the entire ensemble itself rests on “actual” trailers. This piece grafts the miniature onto the life-size, shifting our point of view from microcosm to macrocosm. Alternations of size and scale, from actual-size to gigantic and/or miniaturized models, these models (and all the works become models in some sense) explore mimesis: if the model is composed of items which function simultaneously to indicate a literal concrete reality and to “model” or to “look like something else,” then an absolute relativism results, creating an environment which moves ever nearer to the closure of an endless mirroring. The preponderance of quantity is itself a quality, a way of being that loses all measure. The implication for art is that the work of art may be constructed whenever and however: as in an infinitely rearrangeable cultural space that is similar to the Lego set. In several ways Adams’ works affirm the notion of “nomadism”; his use of vehicles and of models but especially his reliance on substitution as a logic underlying and informing his mode of construction. The thing about the implements or pieces of equipment that Adams features in his sculptures is their equivalence with one another, their interchangeability. That is, one John Deere tractor is as good as another. The next step is to see that the tractor operator is equally interchangeable, and that the artist is implicated in this order as well. This interchangeability is as much a form of nomadism as the more obvious forms evoked by Adams’ use of the vehicle-home as a theme in his work. In Modernism we find a uniformity and standardization of spaces; space conceived of as an abstract continuum: quantifiable and infinitely divisible, but above all, homogeneous in such a way that place disappears. American architect Kenneth Frampton has developed a theory of the placeform, a form which he says has a critical resistance based in presentation of a structural poetic as opposed to the re-presentation of a facade. His theory of place argues for a definition of dwellingsitedness which gathers itself only in dividing itself. In differentiating itself, Place makes room for something by creating limits, boundaries that differentiate it from other places. Such places cannot exist within the indifference of Modern or Cartesian space. Frampton argues that to accommodate differences we need, not simply space, but belongingplaces (topos) integral with the social, natural world. In this conception of space, otherness provides critical relief from self-centeredness through creative encounter with estrangement. Nomadism undermines that possibility by its insistence on non-identity, a move, which without contrasts, cannot provide for the encounter with otherness. By undermining identity in a Nietzschean reversal, authentic relations of difference are simultaneously undermined. Otherness has the potential to function in resistance to the homogenizing of space which proceeds through the expansion of Modernity. Where Adams’ work promotes the culturally prevalent theme of “nomadism” (interchangeability, the preferred social organization of post-industrial technological culture), we can say, along with Marchand, that it “draws us into a complicity that knows no limits.” If Adams’ work has a critical dimension it is one that rests on the ambiguities of complicity. This might be construed as “resistance,” however the real strengths of this work lie in its ability to unsettle, through mimicry and simulation, the “illusory constructs” organizing culture. When it is not weighed down by the seriousness of indusrial fabrication, there is a whimsical pleasure in the humour of Adams’ ironically “populist” vision.